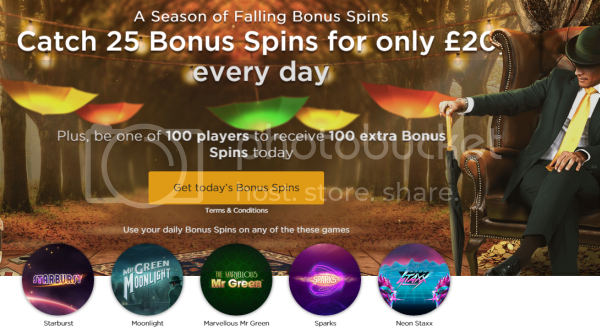 As the leaves begin to fall from the trees, so to do the Bonus Spins begin to fall at Mr Green’s Casino. Over 10 days, pick up 25 daily Bonus Spins when making a daily deposit of £20. It’s that simple, and that much more fun. But that’s not all, every day we will randomly reward 100 of those players who have claimed their daily 25 Bonus Spins with an additional 100 Bonus Spins. That’s an extra 10,000 Bonus Spins per day, and 100,000 over the campaign period! Remember, Mr Green Casino is available on the web or mobile casino. Mr. Green Casino is powered by IGT, Betsoft, Microgaming and Net Entertainment.